Zoos of the 21st century are active partners in conservation. Friends of the Island Fox salutes our Zoo friends. The Fresno Chaffee Zoo has awarded a conservation grant to Friends of the Island Fox for 5 years in a row. They have sponsored 20 radio collars to monitor island foxes in the wild! These radio collars are vital to maintaining a healthy wild population and demonstrate the role modern zoos play in supporting conservation efforts to preserve and restore healthy wild ecosystems. Thank you to the keepers and staff of Fresno Chaffee Zoo for being true island fox friends. Visit the Fresno Chaffee Zoo. The Santa Barbara Zoo is home to four island foxes, three San Clemente island foxes born in captivity and a Santa Rosa island fox with a chronic health condition. The keepers and staff of the Santa Barbara Zoo wrote the book on keeping captive island foxes healthy and on successfully breeding them. When island foxes became endangered in the wild (the crisis years - northern islands, Catalina Island), the knowledge gathered at the Santa Barbara Zoo helped to establish successful captive breeding programs on four islands. Zoo veterinarians have also provided vital healthcare to wild island foxes. 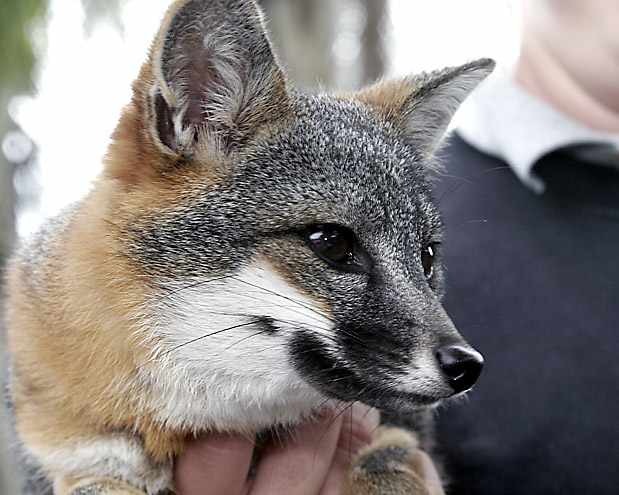 The Santa Barbara Zoo is home to Finnigan, the education island fox, helping to bring the story of this endangered species to thousands of local people every year. 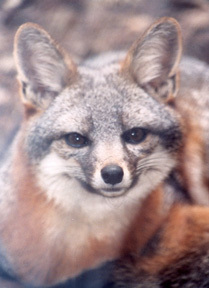 Thank you to the keepers and staff of the Santa Barbara Zoo for being true island fox friends. Visit the Santa Barbara Zoo. The docents of the Los Angeles Zoo and Botanical Gardens have made educating the local community about the endangered island fox a priority mission. 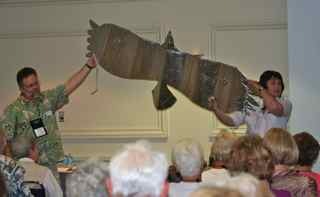 This September they carried their education outreach back to Memphis, Tennessee to the national conference of the Association of Zoo and Aquarium Docents. The success of island fox recovery depends on active partnership between scientists, conservation organizations, government agencies and an educated local community. The Friends of the Island Fox grew out of the docent program at the Los Angeles Zoo and these dedicated volunteers continue to be some of our greatest supporters. (Annual Earth Day event) Thank you to the docents of the Los Angeles Zoo and Botanical Gardens for being true island fox friends. Visit the Los Angeles Zoo. Become a docent.